When I was about to break in to the basket I have found out one "complication". The leaves of bamboo are fragile and after few "openings" they are going to be too broken. Tea leaves are going to crumble around and I will have to put it in to a paper back anyway. So it will be probably much more practical to keep it in the stoneware jar which I hold for myself from the last firing. The jar is unglazed inside. I hope it will have a good impact on the tea stored there. At least I think that the porous material can create affable microclimate for aging of the LiuAn. Leaves of the LiuAn are not so pressed as pu- ehr cakes but still- I find the Pu-needle helpful also in this case. I am not sure if in this case (the Anhui HeiCha- not Pu ehr tea) is the Nei Fei the proper name. But this piece of paper pressed inside of the tea was very nice finding indeed. 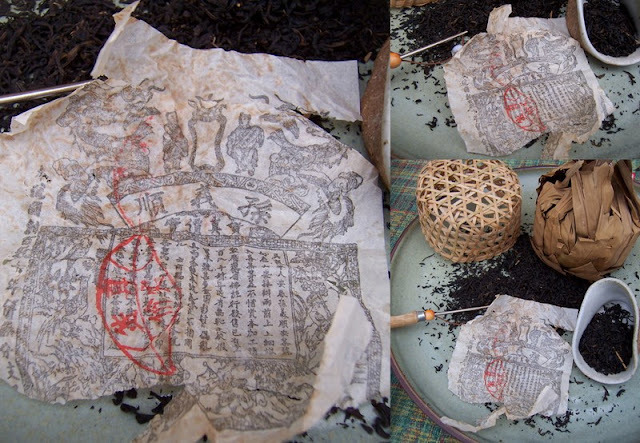 Traditionally the LiuAn is prepared with small piece of bamboo leave in the teapot. So I have putted several leaves from the original basket to the storage jar. It will be not only my supply of bamboo for entirety of my LiuAn teas. It will be also the right environment for those tea leaves themselves. I mean for aging-storing of the tea. The jar itself has a decoration created by white slip (clay) on the rough body. During the top stage of the firing it was partly covered by charcoal- I like those marks and footprints, colors and irregularity which this process creates. Very beautiful jar, I'm sure that your Lui An appreciates his new home. Thanks for sharing ! Perfect jar Peter! Im waiting for this basket right now :-) Hope it will be here tomorrow :-) What kind of teapot do you use for Liu An? Petr, what a beautiful jar! I hope you enjoy the Liu An after it's spent some time in your iron-rich clay. I have a similar Liu An tea, but it is too green for me to drink. Maybe in a few years!